A virus is one of those strange organisms in the world. Technically, it is not alive unless it is inside a living cell. They can often lie dormant in other places until they are somehow inserted into the cells of a plant. Once there, however, they do not leave. Probably the most common symptom of a plant that is infected with a virus is a color trait called mottling. This means that there are weird looking streaks of yellow or white mingled in with the normal green color of the leaf. This coloring is different from what we call variegation although there are times when the two get confused. 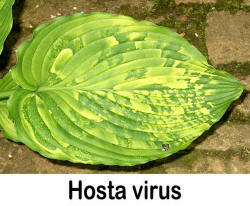 There are cases of a few hosta cultivars that were named and put on the market but later to be determined that the leaf color was caused by a virus. In addition to the mottling effect, plants with a virus often lose vigor and become unthrifty plants. On many plants, the leaves will be twisted and distorted. In raspberries, the fruit will easily disintegrate and crumble. To be certain that a plant has a virus, the physical symptoms are helpful but to know for sure, you will probably need to have a laboratory analysis. Check with you local Extension Service office for labs in your area. Since treatment options for viral diseases are extremely limited or non-existent, prevention is by far the best option for dealing with them. The key is to not have the virus find its way into the plant tissue. To avoid this, we need to concentrate on the ways that a virus can move from plant to plant. They don't have legs or wings so they depend on the kindness of others to get around. Instead, they look to so-called vectors, to spread them around. 1. Mechanical - Perhaps a key way that virus infections spread in plants is through what are called mechanical means. The number one culprit here is pruning equipment. Snipping a stem, flower or leaf from an infected plant and then cutting a healthy but susceptible plant can spread some of the sap from one to the other. This can easily move the ultra-microscopic virus. 2. Insects - Sucking insects such as leafhoppers, aphids, spider mites, etc. are often excellent vectors for virus movement. They draw sap from one plant, move to another susceptible plants and, in the process of inserting their snout into the next plant, they spread the virus. 3. Seeds - Although not very prevalent, occasionally a virus can move into a seed so the resulting seedling will be infected by that virus. Once the virus is in the plant, there is currently no practical pesticide treatment that will eliminate it. So, prevention is the key. 1. Virus Indexing - At one time in the mid-1900s, the beloved Easter Lily became infected with a virus. It spread rapidly through mechanical means and soon threatened to eliminate the entire crop. No more Easter Lilies! Then, someone figured out that the virus moved up the plant starting down in the bulb. With a little study, they found that it lagged behind the growth of the stem just a little so the very tip was virus free. Propagators were able to take cuttings from these tips to produce new, clean plants and the problem was overcome. 2. Tissue Culture - Similar to indexing, the micro-propagation technique called tissue culture can also be used to produce virus free plants from infected ones. In the lab, they find tiny bits of tissue that do not contain the virus and produce large quantities of new, clean plants. The final lesson here is, especially when dealing with plants known to be susceptible to virus, be sure to purchase new plants from sources that guarantee that their plants are virus free.